We’re seeing a revolution taking place in our classrooms and in our schools. This revolution is being driven by technology. If we truly want to provide each and every child with the quality education they deserve, utilizing digital resources will be a major spoke in the process. Technology is enabling the personalizing of education in the 21st century. Mastery-focused skills and concept progression via technology-enhanced learning modules. Scores of superintendents across the country are leading successful models of digital transitions across the country in an effort to enable high-quality learning in their school systems. However, these superintendents agree with me that it’s not just about putting a laptop in the hands of a child. It’s not about running to the store and purchasing the latest gadgets. It’s critical that a plan is in place prior to putting the mechanics in motion. Making the digital leap is popular but we need to be careful. The question remains: How will the technology enable children to learn? Earlier this month, we were pleased to see superintendents who are engaged in the digital transition convene at Discovery Education as part of AASA’s Digital Consortium. Said Gail Pletnick, superintendent of Arizona’s Dysart Unified School District, “As superintendents, we are so involved with our leadership roles, we forget to nurture ourselves as learners.” At the Consortium, we were especially pleased to see district leaders taking part in learning from the experiences of others. Professional development plays a huge role in bringing about the transformation of teaching and learning in our schools and I applaud the superintendents who joined us and shared best practices and strategies for the benefit of others. We look forward to our next Digital Consortium meeting this summer in Chicago. I encourage you to contribute to the conversation. Please access #AASA_DigitalConsortium. 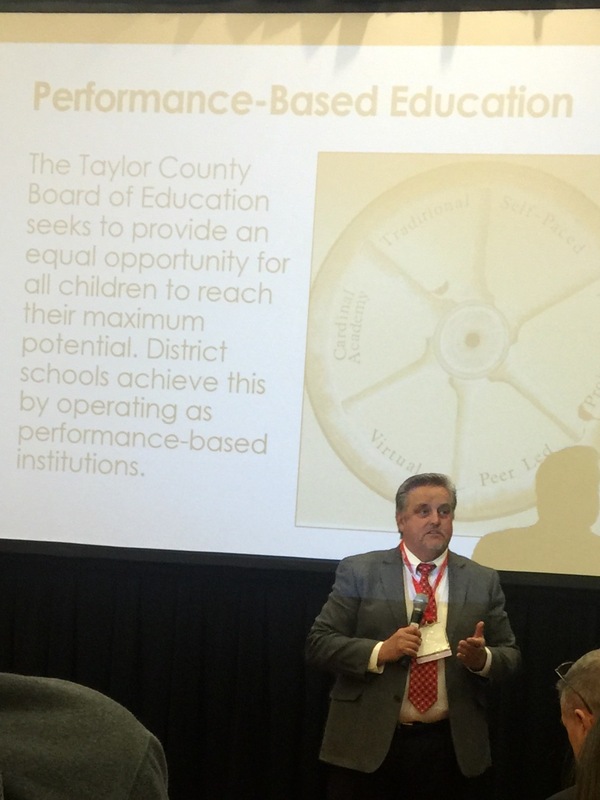 I recently had the opportunity to listen to Superintendent Roger Cook speak about the great work he does for the Taylor County School District in Kentucky. He has been the superintendent there for seven years and only recently did he discover that what he does is now called personalized education. Taylor is one of the first districts in Kentucky to be named a District of Innovation, and why? Students are not allowed to fail in Taylor County. Staff will work with each student until they get it right. It can happen because every student receives a personalized education and what they are learning is at the appropriate ability level, always. Consequently, Taylor has a zero percent drop-out rate. They also claim to have the highest graduation rate in the nation. It’s a performance based system where, in order for students to move on to higher content, they must achieve 90% mastery of the current content. They define it as “a system of teaching and learning that places students in grade-level content areas based on mental capacity rather than chronological age”. Taylor provides every student with the opportunity to receive an education in six different ways. They can choose one of them or they can choose all six. There is actually a traditional program for students who may want that, or part of the time. This seems to have the lowest enrollment. Students can also participate in self-paced, project based, peer led and virtual programs. They also offer a Cardinal Academy that students can apply for but only one hundred students are selected. The students in the academy are totally self-directed and choose from the other five offerings.